Choosing skincare products for your baby – or for yourself for that matter – can be a bit like reading a foreign language. Organic? Natural? Free of PABA? What does it all mean? One quick and easy way to identify products that you know are safe is to look for the National Eczema Association Seal of Acceptance. Let’s walk through what this actually means. This is a test where the product is applied to people and doctors watch over a six-week period of time to see if it causes any allergic reactions. In this second test, the product is applied to the skin multiple times to see if there is any irritation when the skin is exposed to the product over and over. This test determines whether using a product could help to cause sunburn when someone spends time in the sun with the product on their skin. If a product has achieved the National Eczema Association Seal of Acceptance™ it means that the product has had all of these tests and passed. It also means that the company invested the time and money to ensure that their products are safe. If products are safe enough to use for sensitive skin or for eczema skin care, they are definitely safe enough for normal skin. Baby Pibu™ is dedicated to producing only the highest-quality, safe products for our tiny customers. Our products have undergone clinical testing including patch testing, cumulative irritation testing and phototoxicity testing, and it was determined that they did not cause irritation, allergic reactions or sunburns. Our Bathtime Wash, Baby Butter and Hydrating Ointment proudly carry the NEA Seal of Acceptance. We take product safety very seriously and believe that parents of little ones do too. 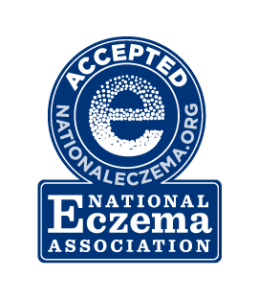 The next time you are shopping for a skin care product for yourself or your family, turn the product over and look for the National Eczema Association Seal of Acceptance™. You will feel good choosing products you know have been clinically tested and are safe for your whole family.